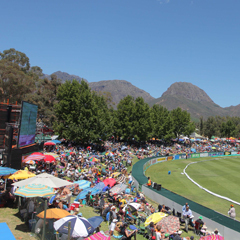 Paarl - Cricket South Africa (CSA) has apologised to fans around the world and in South Africa for the loss of transmission at various stages during the second innings of the first ODI between South Africa and New Zealand in Paarl last Saturday. This was due to unforeseen circumstances beyond the control of CSA. There was also a power outage in the stadium during this period. During the break in transmission no DRS was available to be utilised by the match officials and the umpires did inform the players on field as such. The matter is currently being addressed with broadcasters SuperSport to avoid a repetition of what transpired. SuperSport will investigate the matter and provide CSA with a detailed report. New Zealand won the first ODI by one wicket. The second ODI will take place in Kimberley on Tuesday (14:30), with the series concluding in Potchefstroom on Friday (14:30).